David Johnson smiles while running through drills at training camp in Glendale. 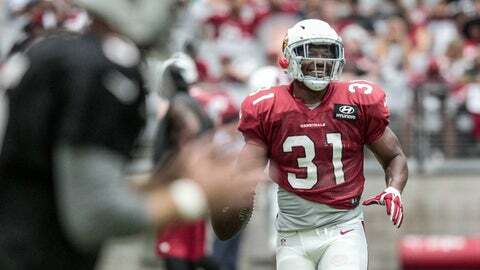 GLENDALE, Ariz. — David Johnson is a dream for those who play fantasy football — a big, fast, agile running back and an outstanding receiver who scores a lot of touchdowns. "David has all the tools," Cardinals running backs coach Stump Mitchell said, "to be — given longevity — one of the best backs ever to play that game." "Hearing some of the greats I watched growing up — you know, Marshall Faulk — being compared to some of those guys is amazing," Johnson said. "But on the other hand it makes me want to live up to those expectations. So I’m trying to do as much as I can off the field, on the field, in the weight room, nutrition, training room." Six running backs were drafted in 2015 before the Cardinals selected Johnson out of Northern Iowa in the third round, the 86th player chosen overall. And as anyone who has watched the "All or Nothing" video series chronicling last season knows, Johnson was not Arizona’s first choice as a running back. A scene shows the Cardinals about to select Nebraska’s Ameer Abdullah in the second round when Detroit snatched him away one pick ahead of them. "You know, God has a way of stepping in," Mitchell said, smiling. The next week against Detroit, he returned the opening kickoff 108 yards — a franchise record — for a score. Two touches, two touchdowns. "The role just kept increasing and opportunities just kept coming his way," coach Bruce Arians said. "When you make the best of the opportunities, Wally Pipp you know, you forget about the other guy." "I always had confidence in myself," Johnson said. "I just wanted my shot. I just wanted my chance to prove that I was capable of being able to play in this league. Of course, I got down on myself a little bit when I wasn’t getting any recognition out of college from some of the scouts and some of the coaches, but I always thought I had the ability to perform with these guys." "There’s two runs that he pulled away from everybody," quarterback Carson Palmer said, "and I mean everybody on the field — and there were starters on the field." The soft-spoken Johnson calls himself "a strider." People don’t realize how fast he is, he said, "until they see a defender trying to catch me." 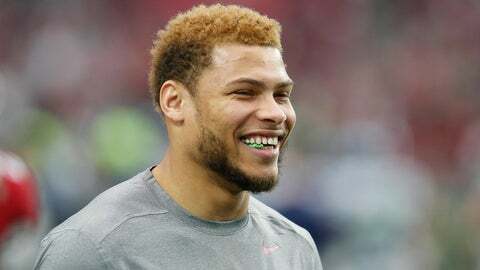 "I reflect on all the sacrifices," Johnson said, "everything that I `ve been through growing up, not getting too much recognition coming out of college and all the hardships I had growing up. Every day I think back and thank God for giving me the blessing of doing it." "I couldn’t ask for a better life right now," he said.